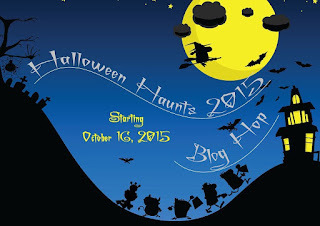 Welcome to The Queen's Palace and the Halloween Haunts Blog Hop. I'm so glad you stopped in for a spell. There have been some pretty chilling things brewing in the cauldron. Witchy Marian at Seams to Be Sew has been stirring the pot and came up with a fabulous line up of ghost, goblins, ghouls, and other witches, as well as a nice sponsorship from the Fat Quarter Shop. Thanks you so much Witchy Marian and The Fat Quarter Shop. I gave you a sneak peak at Miss Batty Lou Boo last week. Well look how good she dresses up for the party. Miss Batty Lou Boo is a "Stitch by Number" project. You can read about it here. I changed her nose out from the project kit. She originally had a wooden nose. I thought she needed a purple nose so I dug through my button tin and found the perfect one. I really like the white thread to attach the button eyes. Gives Miss Batty Lou Boo some sparkle in her eyes. Then some creepy cobwebs and friendly spider quilting too. Miss Batty Lou Boo would like for you to meet her special friend, Mr. Bones. He didn't dress for the party, just tipping his hat to the lady witch. Mr. Bones likes cobwebs and spider quilting too. Lots of mini Mr. Bones on the backing. Mr. Bones' border was really easy to do. It's a variation of the "five minute block". Now how about a treat (no tricks I promise). You can win a project kit and make your very own Miss Batty Lou Boo. Tammy at Happy Hollow Designs were generous enough to provide me with a giveaway. All you have to do is leave me a comment and tell me, Do you have Halloween quilts and/or wall hangings? Then enter the rafflecopter drawing below. You can also enter to win a $25 gift certificate from the Fat Quarter Shop. Just enter the rafflecopter drawing below. Miss Batty Lou Boo and Mr. Bones would like to get together with all the other haunting goodness that's going on in the Halloween Haunts Blog Hop. Why don't you join them at these sites today. I have been busy collecting some fabrics for Halloween projects but haven't finished any yet. Strange since Halloween is one of my favorite holidays. 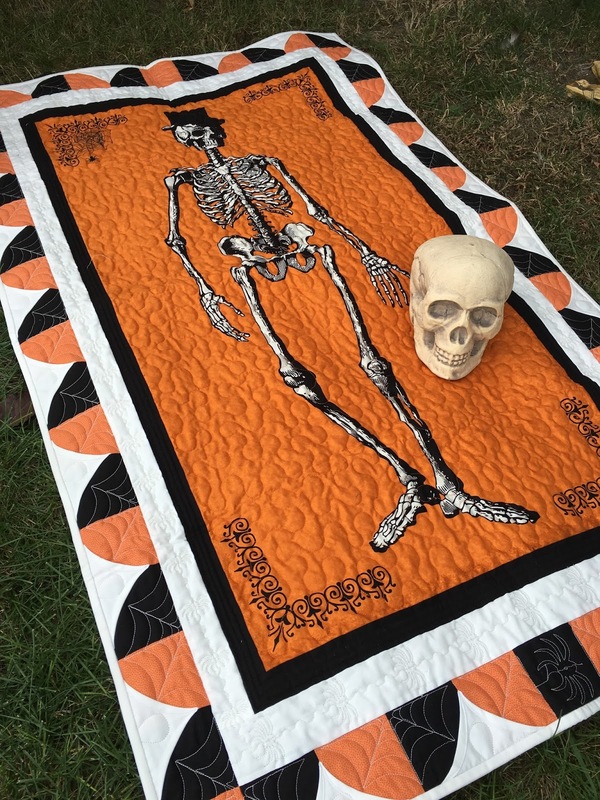 No, I don't have Halloween quilts or wall hangings, but I have made a couple of Halloween quilts for charity a few years back. What great projects. Love the detail quilting!! 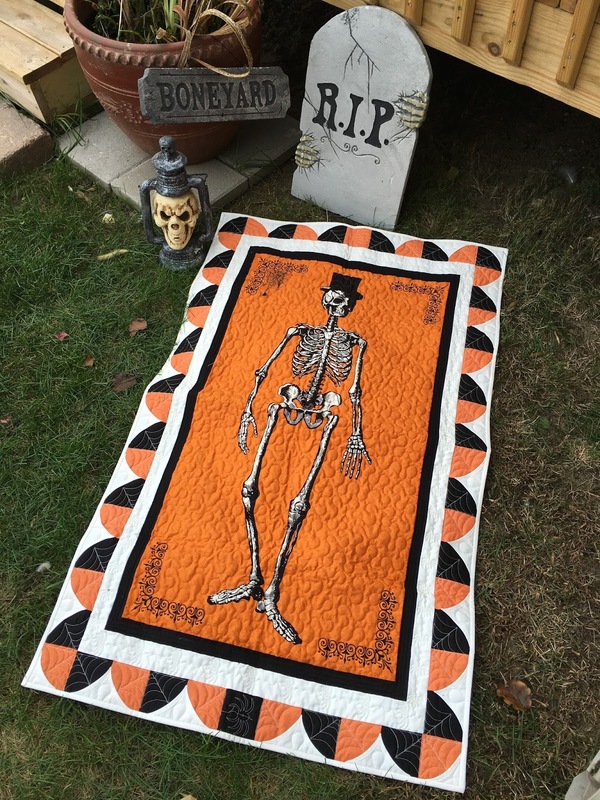 I have a couple of Halloween quilts & several mug rug themed Halloween items as well. I love Miss Batty Lou Boo! She is quite a cutey, and Mr. Bones is rather dashing. 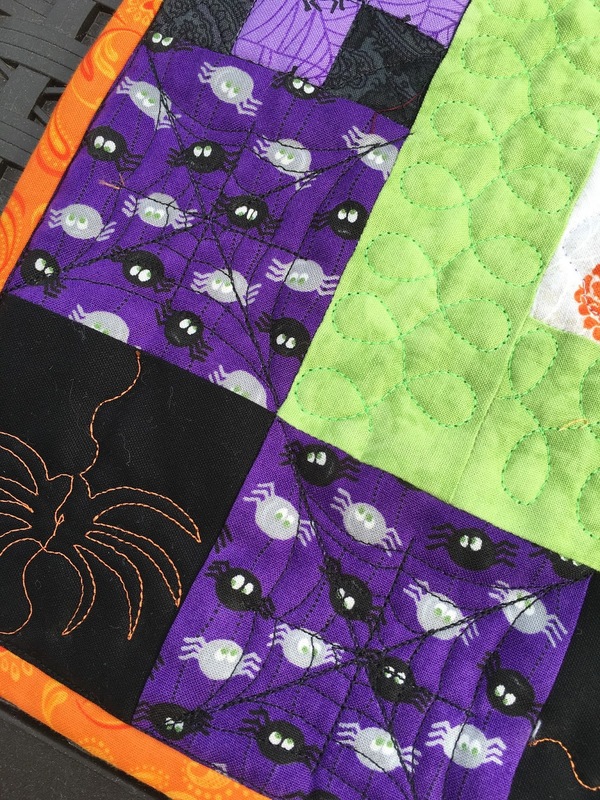 I made my niece a sampler block Halloween quilt last year, but I haven't had time to make the black cat wall hanging for myself that I wanted to. Hopefully I will get to it soon. Love your projects and quilting designs! I only have a cross stitched Frost is on the Pumpkin wallhanging-have gifted all of my other Halloween quilts, so it's time to make one for myself! Your projects look very cool! 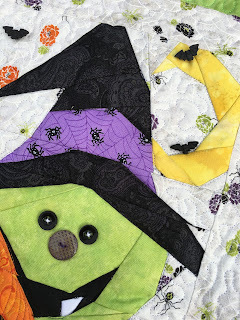 I have no Halloween quilts as we don't really celebrate this in Switzerland, lol! Doris, I have both plus tAblerunnera and placemats. I love Mr. Bones! Very cute! I especially like the spider quilting. 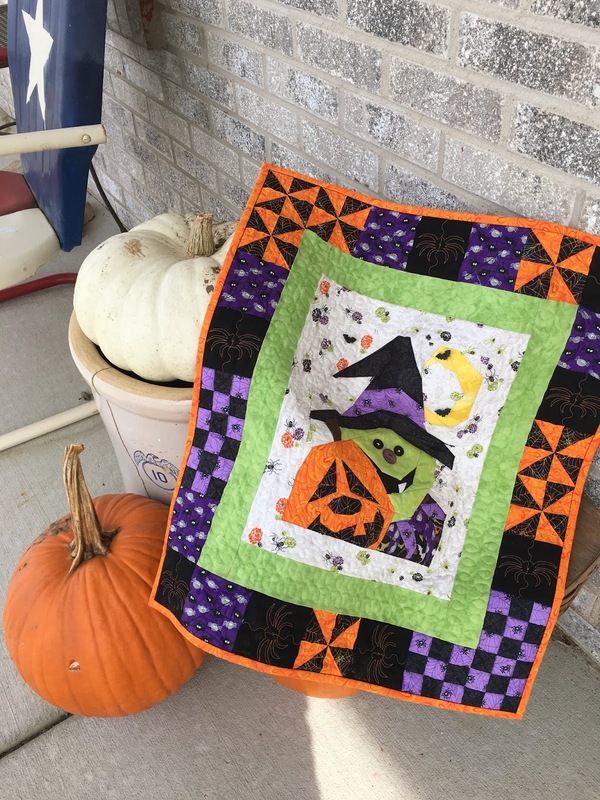 I have made a bunch of Halloween table runners and wall hangings and given them as gifts, but haven't kept any for myself. This hop makes me think I need to make something to decorate my own house! Both your projects are awesome! I've recently started paper piecing, and I love it. I have made a few Halloween wall hangings over the years. I love your pumpkin witch, they are very cute. I would enter, but paper piecing is not my thing. Both quilts are so beautiful. Love the quilting of Mr Bones with those spider webs in the borders !! 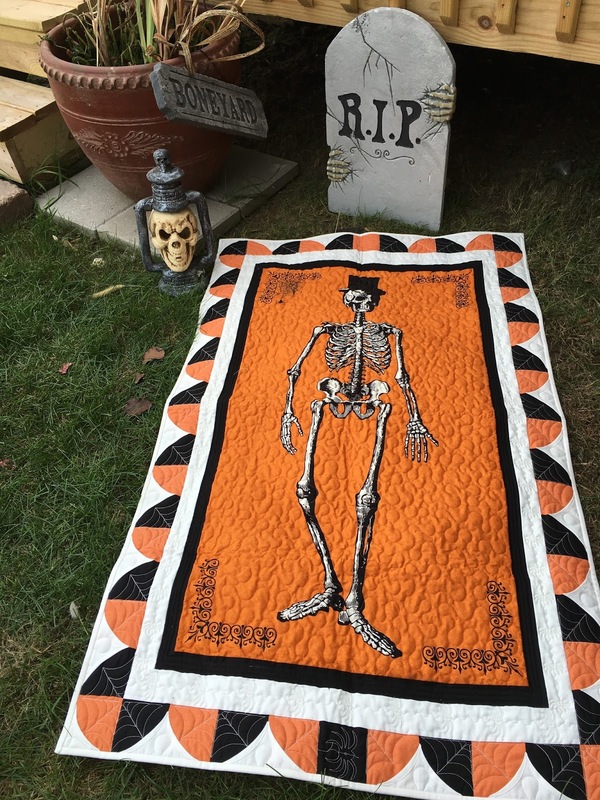 I also have some halloween quilts, just love them. These are great quilts! Wonderful job. I've got Halloween quilts all over my house. Great projects Doris. Love the quilting on them! 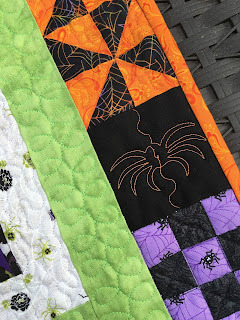 I love the spider quilting around your Halloween quilt borders. Mr Bones an Miss Boo make a perfect pair . 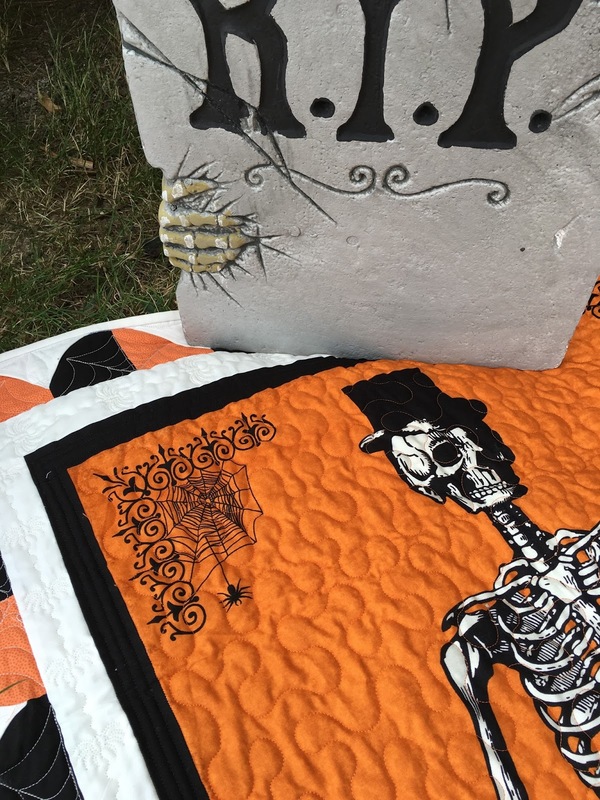 I have lots of wall quilts for Halloween .Love them. Happy Halloweeen. Love both of your quilts, the quilting is over the top. Really into your spiders. I currently have at least 4 quilts and a bunch of pillows and some wall hangings spread around my home. Several years of participating in Halloween quilt hops have been very good to me. Your wallhangings are sew really cute. I have a couple of Fall wallhangings. Thanks for the great giveaway. I have made a number of Halloween wall hangings, mug rugs, and table toppers and am planning a quilt this year. It will have embroidery panels and I'm only about a quarter of the way done. Mister Bones would go up on my hall wall perfect size and would be admired from the great room making is statement of the season. At his moment I do not have any Halloween quilts, but I do have a table topper. Currently I dont have too many Halloween quilts or wallhangings - just one jack o lantern that I sort of drafted myself. Nothing fancy. Sure do like the Miss Batty Lou boo though. These are both cute projects. I love them both so much. I don't have a halloween quilt yet, but I WILL!! These are two fun quilts! Love that backing for Mr. Bones. I like wall hangings and sofa quilts for Halloween. 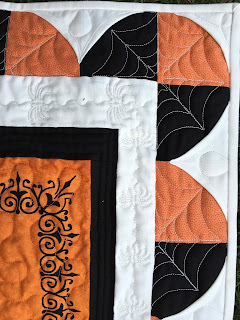 I have a halloween quilt - a combo Irish chain and Jack'o lantern blocks. I am working on a wallhanging that may or may not be done in time! Both of your quilts are fabulous, Doris. I love the borders on both of them and your webby quilting is incredible. 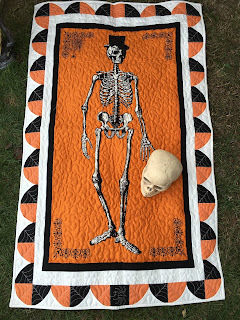 I have several Halloween quilts scattered throughout the house. Your quilts are cute and I love your quilting! I don't have any Halloween quilts yet. Thanks for sharing your projects. Miss Batty Lou Boo is so cute along with that jack-o-lantern and so is Mr. Bones! Your quilting looks amazing...love it! Just loved all your quilts. Isn't Halloween fun? 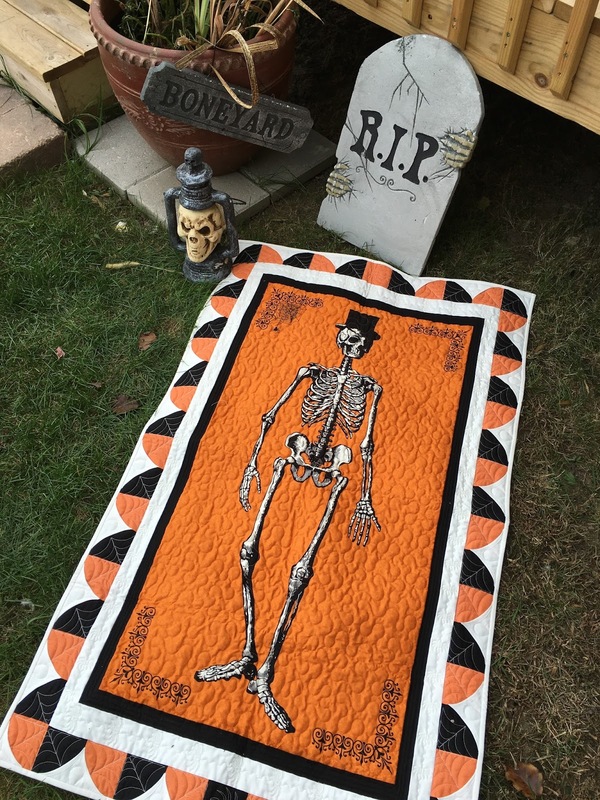 I have one large and one medium quilted Halloween wallhangings and several small cross-stitched ones. i have a quilt, pillow cover, wall hanging, and stuffed fabric pumpkins. Great quilt! Right know I have none done Thanks for the giveaway! Oh how I love them both. Batty boo really speaks to me though. (scary though I know) LOL! Love Miss Batty Lou Boo! She is adorable and would fit right in with all my other wall hangings. I have lots of wall hangings, runners, mug rugs, and some quilts are next on the list! Mr Bones is quite the dandy in his fancy hat, dressed or not! LOL Thanks for sharing. I have Halloween table runners and mats but no full quilts. I love Miss Batty Lou Boo, the quilt and the name! I Love Miss Batty Lou Boo! Your Spider and Spider Web Quilting are Amazing! I don't have a Halloween Wallhanging. But I plan to sew only Seasonal things next year! And Quilting Queen YOU ARE! These ARE FABULOUS! Your stitching...the fabrics, the designs..that skeleton!!!! I just think you are the Halloween QUEEN! Ohhh, I like her, she is so "Scary" good! I like your nose better than a wooden one. Your skeleton is equally adorable. I like how you did the boarder. And your quilting is perfect! Cute quilts! I love the border on the skeleton one. The only one I have is the very first small wall hanging I made. It has three pumpkins and I hang it up for the entire fall season. Its not perfect but it is my first and I am proud of it. Miss Batty Lou Boo is so Boo-dorable and I love Mr. Bones! Been thinking about getting one of those panels and now I know I must. Thank you! 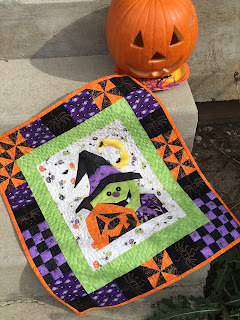 I have several small Halloween quilts and wallhangings - they are so much fun! I have more Fall style runners and place mats, but do have a Halloween wall hanging. I love the cute design you made. I love your quilts - especially the face on the pumpkin. So cute! Unfortunately, I don't have any Halloween quilts or wall hangings. Thanks! Great quilts and the quilting awesome Love the spiders. I do not have a Halloween quilt ---- YET. I have lots of Halloween fabric. Miss Batty Lou Boo is darling. She'd be perfect for my door on Hallowe'en. I don't have any quilts yet, but I have collected some appropriate fabric. 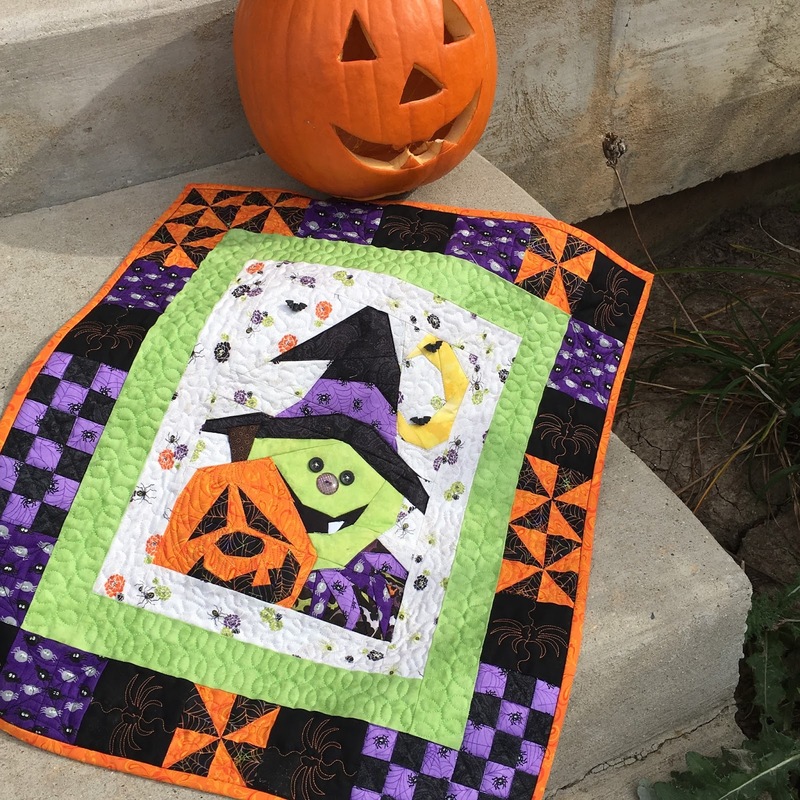 What a fun quilt and a charming pair of Halloween greeters to your trick or treaters! I love how the white thread gives a real sparkly to Miss Boo's eyes. Or maybe it's her look at Mr. Bones that is doing it?? I don't have a Halloween quilt or wall hanging, but I do want to make a Halloween quilt. I will definitely shoot for having it done for 2016! I don't have a Halloween quilt or wall hanging, but I do have two skeletons made from empty milk cartons that hang out on my front porch. No Halloween quilts or wall hangings here. I do have a table runner. I love the names that you gave your scary friends! The quilts are delightful! I have a quilt that I made several years ago from blocks that I swapped on the internet. I made 2 bed quilts for both of my kids, and then the leftovers went into a small wall hanging. I have a wall hanging that I made a couple of years ago. Just haven't taken the time to quilt it yet. I actually made 2 tops and sent one to my best friend. She finished hers. I would love to have a Betty Lou Boo of my own. Thanks for the chance to win. I have a couple of wall hangings that I've made that I love to put on display for Halloween. I love your wall hangings, soooooo cute! Miss Batty Lou Boo is so happy and so is her pumpkin friend. My grandchildren will love this. Thanks you so very much! Have several Halloween wall hangings. This year I made a bunting to hang from our balcony. My little grandson would love this. Thank you for the opportunity to win. I have a Halloween table topper that I love! No but would like to add yours. I make them as gifts for my cousin, who lives in France and adores Halloween, her favorite holiday. What a darling Halloween wallhanging. Let's see--I have 4 Halloween placemats, 2 different wallhangings and a large lap quilt, still more are planned! 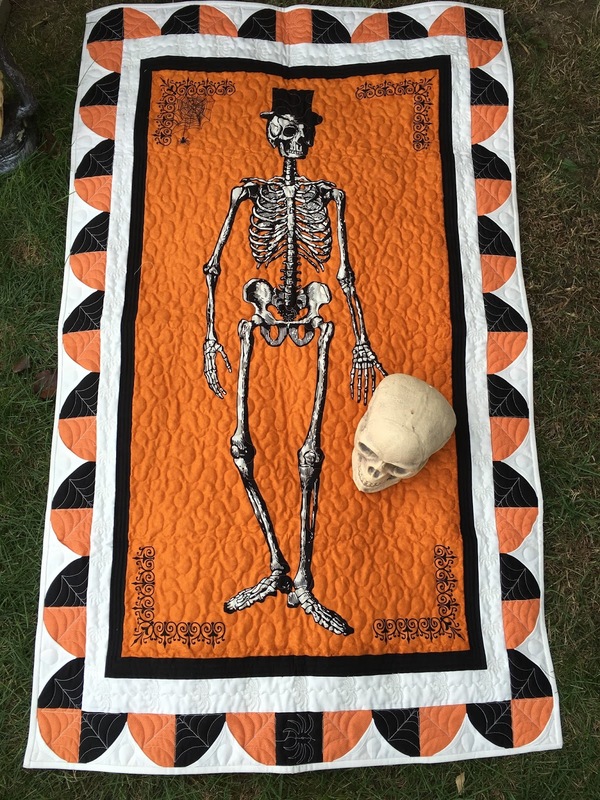 Very cute wall hanging - love Mr Bones (just after the Ghastlies) and your quilting is fantastic. No Halloween decorations inside, but a few outside. It has been my intention to have Halloween quilting projects in my home (I love the holiday), but I haven't gotten that far to sew them up! I've collected fabrics, but that's it. Now seeing Miss Batty makes me want to get busy! I don't have any Halloween quilts or wall hangings but I've been meaning to make one for years. 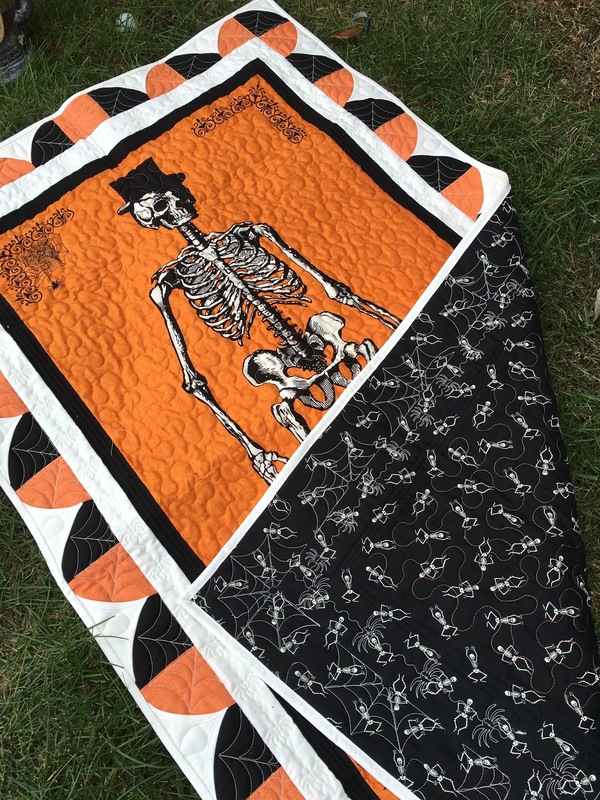 I love the spiderweb quilting you did on Mr. Bones. I have one small wall hanging I think the pattern was from McCalls magazine years ago. I don't have much in quilted items for Halloween just some runners, placemats and a bunting. I really love the wall hangings I've seen in this hop and I must make one!! I think miss batty is so cute and not scary which I like. I have the mr. Bones and like how you put that quilt together. I do have several Halloween wall hangings. I don't have any Halloween quilts yet. But I have the fabric and I am working on it! I love the details in the thread. So neat. I love Halloween! Thanks for the giveaway! LOVE these quilts! 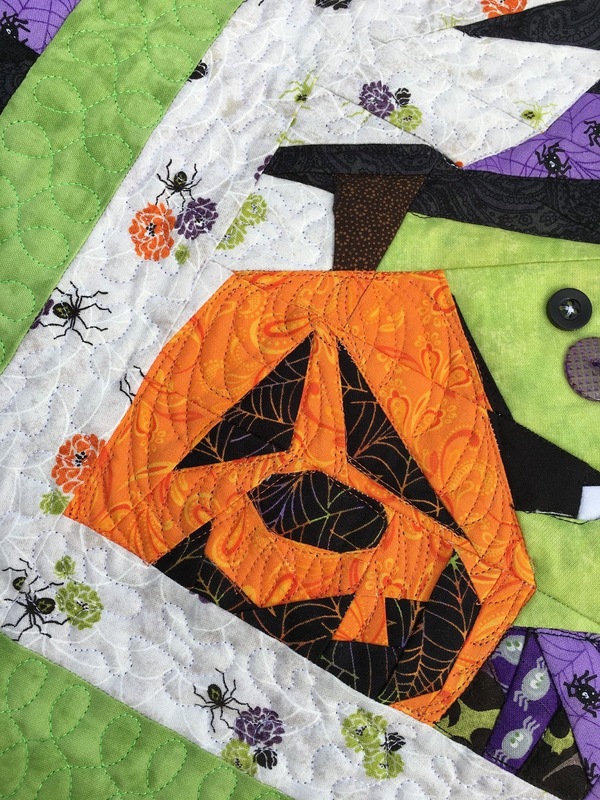 I also really love your halloween quilting! What a great finishing touch! I am currently finishing a Halloween Table runner. These are all so great! Love your Halloween! What a cute quilt! Miss Batty Boo is adorable, and I'm so glad Mr. Bones joined the party. Wonderful quilting on both! Hi, Your Highness yes I do have Halloween wall hangings and fabric pumpkins too. This would be a really fun addition to what I have. You did an outstanding job. I have several Halloween wall hangings. I love to decorate with them! Thanks for the opportunity to win. I'm not sure my first attempt to post worked, so I'm truing again....I have a fall wall-hanging, with pumpkins, and a spider web quilt top that isn't a quilt yet. Do either of those count? If not, then I need to win your drawing so that I can have something Halloweenie! great projects. Love the pinwheels! I have several fall wall-hanging and small quilts all over the couch. Best way to decorate! Love both of your creations! I am currently working on a wall hanging for my sister for Halloween as she loves it. I'm also working on a tablerunner for myself. Miss Batty Lou Boo is super cute. I am making myself a mug rug for Halloween. I can't believe I haven't made one for myself before. Thanks for sharing. no I don't have a halloween quilt. these are adorable. I love all your projects. You've done a great job with the quilting. I do struggle with that.